This piece was originally published on the British Council Pakistan website. Republished with their kind permission. 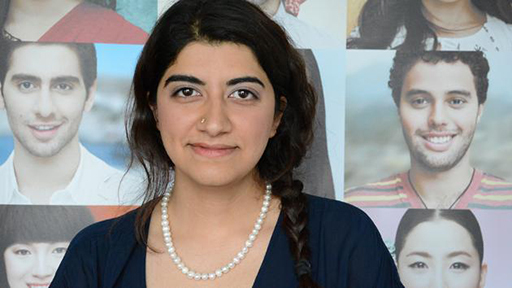 27 year-old Maria Khan is this year’s winner of the IELTS Award, the first of its kind in Germany. Maria, originally from Pakistan, has just finished her Bachelor’s course (her second!) at Bard College Berlin. Her application was chosen out of more than a hundred we received. British Council | IELTS will cover £10,000 of her tuition fees at Newnham College at the University of Cambridge in the UK. We wanted to learn more about her, so we have met up with Maria to talk about her impressive application and plans for the future but also to learn more about her passions outside of university. FIRST OF ALL, HOW DID YOU LEARN ABOUT THE IELTS AWARD? WHO OR WHAT DREW YOUR ATTENTION TO IT? Maria: I found about the award through the IELTS website. I was registering for the IELTS exam, I read about the award and thought I could apply for it. TELL US A LITTLE BIT ABOUT YOURSELF, HOW YOU ENDED UP IN GERMANY AND WHAT YOU’VE BEEN DOING HERE. WE HAVE HEARD A CERTAIN PAKISTANI POET PLAYED A ROLE IN YOUR DECISION AS WELL. WOULD YOU LIKE TO TELL US MORE ABOUT HIM? Maria: In 2010, I graduated from Kinnaird College for Women Lahore. After completing my BSc Economics I had decided to pursue public policy. However, I always wanted to study in Germany since one of the leading Pakistani poets and philosophers, Muhammad Iqbal, received his education at Heidelberg University, Germany. Iqbal also received part of his education at Cambridge, where he was the student of neo-Hegelians i.e. John McTaggart and James Ward. Iqbal’s poetry and philosophy had been an integral part of my upbringing and not only had Iqbal received his education in Germany, he was very much influenced by Nietzsche’s concept of Will. While looking for schools in Europe I came across a very small residential liberal arts university called European College of Liberal Arts, Berlin, now called Bard College Berlin. Initially I came for a one year program to study literature and philosophy before I began graduate school, but I realized that I wanted to invest more time in the humanities; reading, writing and thinking about works of the Western canon and learn languages i.e. German and French. WHAT ARE YOUR STUDY PLANS? WHERE ARE YOU GOING AND WHAT DO YOU WANT TO USE THE IELTS AWARD FOR? WHAT IMPACT DO YOU WANT TO CREATE AFTER FINISHING YOUR DEGREE? ONE OF THE BIG TOPICS FOR YOU IS WOMEN’S RIGHTS IN YOUR HOME COUNTRY OF PAKISTAN – CAN YOU TELL US A LITTLE BIT MORE ABOUT THAT? Maria: During my four years in Berlin, I became interested in the process of learning and what is the meaning of good or necessary education? It is difficult to come up with a precise answer to this question, but I believe one of the functions of good education is to develop critical thinkers. I am interested in seeing how arts in education can be used to teach attitudes of tolerance and tolerance as an idea of progress and not simply acceptance of the other. I believe that through arts we can train people to think critically, question old dogmas and learn in a manner which allows them to change their mind-sets. Drama for me is one of the best mediums through which stories are told and by taking on different roles one begins to question the motivations of another character and it opens up different perspectives on thinking about life situations. Through teaching drama one could also deal with difficult social issues, such as female education and rights of minorities. Stories could be told around these areas and if not explicitly about these issues, engaging with the piece of drama allows students to do a mental exercise of thinking about life situations from different lenses. At Cambridge, I will be doing MPhil Education, specializing in arts and culture. The IELTS Award will go towards my tuition fees at the University of Cambridge. THE COLLEGE YOU HAVE CHOSEN IN CAMBRIDGE IS OBVIOUSLY VERY PRESTIGIOUS. WHAT MADE YOU CHOSE NEWNHAM? Maria: My A-level literature teacher, Professor Shaista Sirajuddin studied at Newnham during late 1960’s. Her teaching style was very peculiar and indeed the breadth of her knowledge was remarkable. She remains one of the most influential teachers in my life, particularly due to her strong personality and competency in her field. NEWNHAM IS A WOMEN-ONLY COLLEGE. NOTABLE ALUMNAE INCLUDE EMMA THOMPSON, ALI SMITH, CLAIRE TOMALIN, SYLVIA PLATH, JANE GOODALL AND DIANE ABBOTT – DO YOU SEE THAT AS INSPIRING OR DAUNTING OR MAYBE BOTH? IS THERE ANYTHING THAT CONNECTS YOU WITH OR INSPIRES YOU ABOUT THESE FAMOUS ALUMNAE? Maria: I was excited beyond words to have found a place at Newham, and due to my own acting background, I was so happy to share something with Emma Thompson, who I consider to be one of the finest actresses of our times. It’s extremely thrilling so far, and I really hope to create very meaningful work as I continue my academic and professional career. WE’RE SURE YOU WILL. OUR COLLEAGUE ALSO TOLD US THAT CAMBRIDGE DECIDED TO ALSO AWARD YOU A GRANT FOR YOUR STUDIES THERE. WOULD YOU LIKE TO TELL US A LITTLE BIT MORE ABOUT HOW THAT CAME ABOUT AND WHAT THIS MEANS FOR YOU? Maria: I have received an award from Cambridge Trust which will pay part of my university composition fee. The award is given on the basis of academic merit and financial need and this award allows me to be a part of a huge network of scholarship holders at Cambridge. EXCELLENT! WE’RE VERY HAPPY FOR YOU. YOUR CHOICE OF COURSE, COLLEGE AND GOALS ARE ALL HUGELY IMPRESSIVE, BUT WE’D ALSO LIKE TO KNOW A LITTLE BIT ABOUT THE PRIVATE MARIA. WHAT DO YOU ENJOY DOING IN YOUR FREE TIME? WE HAVE ALREADY HEARD DRAMA PLAYS A BIG ROLE IN YOUR LIFE AND YOU ARE AN ACTRESS YOURSELF. WHAT ROLES DO YOU MOST ENJOY PLAYING? Maria: I have been acting since I was very young and theatre has taken up most of my time apart from academics. One of the roles which I enjoyed the most was in Michael Frayn’s Noises Off . I played the part of Belinda, a middle class, English woman, who is persuading her husband to attend to her, while he constantly worries about the tax people. I did this play at California Polytechnic State University, where I was spending one semester on a US State scholarship. The play ran for eleven days and I worked with incredibly talented people. I have also performed at Shakespeare’s Globe and directed and acted in plays at Bard College Berlin. Other than acting, I love to be out in the nature. I have just spent a month on a sheep farm in a small village near Dresden. I helped the famer make hay and prepare the meadow for sheep grazing. I would like to have my own sustainable farm one day. I also like going for long walks and I spend a lot of time writing; I write to feel good and light about myself. APART FROM THAT, DO YOU ALSO ENJOY COOKING OR OTHER ACTIVITIES? Maria: I take a lot of interest in buying nice clothes and improving my wardrobe. I am not a hoarder but I think it’s a very good distraction and I often indulge in it, when I can’t afford to buy clothes, I enjoy looking at them. And I like to play Badminton, (one sport, I am very good at) when I have very good company for it. HOW MANY DIFFERENT COUNTRIES HAVE YOU LIVED IN ALREADY? WHAT WAS THE MOST INTERESTING AND ALSO THE MOST BIZARRE THING THAT HAPPENED TO YOU AND THAT YOU NOTICED DURING YOUR TIME LIVING ABROAD? Maria: I have travelled a lot and have lived in three different countries: Pakistan, the US and Germany. One of the most interesting things which I experienced was the 2008 Presidential elections in the US. I was in the middle of a play at the University, all actors were lined up for their cues when someone ran into the backstage area and said “Obama WON”. I lived through the excitement, joy and the experience of America making history in the world. One of the most bizarre experiences here in Germany has been going to Volksbühne for theatre performances. I somehow find productions at Volksbühne ambiguous, a bit too self-reflective and at times over the top. FINALLY, WHERE DID YOU TAKE YOUR IELTS TEST WITH US AND HOW WAS THE TEST EXPERIENCE FOR YOU? WAS IT THE FIRST TIME YOU HAVE TAKEN AN IELTS TEST? Maria: I took my IELTS test at the British Council in Berlin. I found the staff and everyone organizing the test to be extremely pleasant and friendly. This was my second time taking the test; I had taken IELTS before in 2010 in Pakistan. THANK YOU, MARIA. IT WAS GREAT TALKING TO YOU ABOUT YOUR PLANS AND WILL BE INTERESTED TO HEAR MORE ABOUT YOUR STUDIES AND EXPERIENCE IN CAMBRIDGE AFTER YOU HAVE ARRIVED THERE.